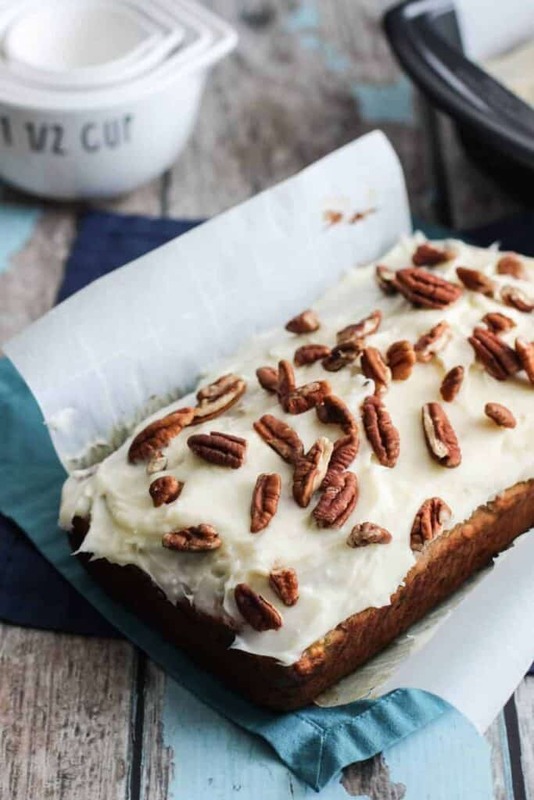 This Hummingbird Banana Bread with Cream Cheese Frosting is a delicious mashup of a Hummingbird Cake (a Southern classic) and banana bread. 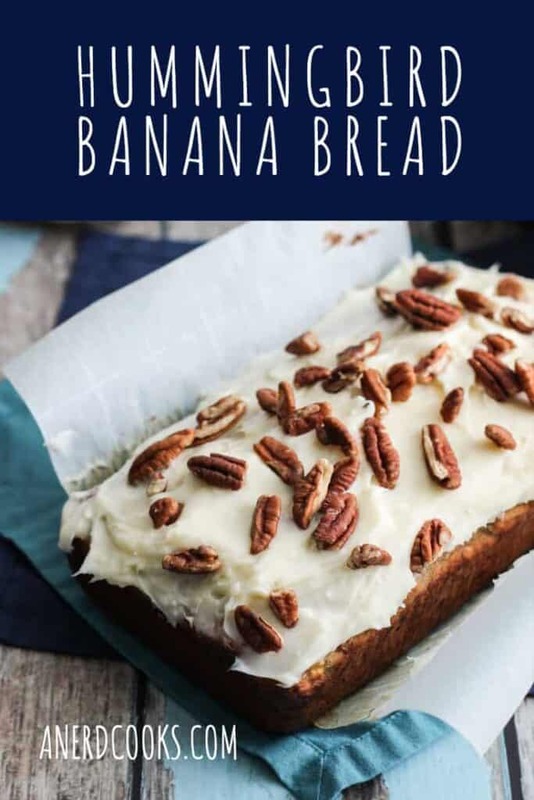 After making Carrot Cake Cupcakes recently, and realizing that I had an overabundance of overly ripe bananas (as usual), I got to thinking about other dessert recipes that used lots of fruit and or vegetables. After some searching, I landed on Hummingbird Banana bread. This recipe is full of crushed pineapple, shredded coconut, chopped pecans, and bananas. 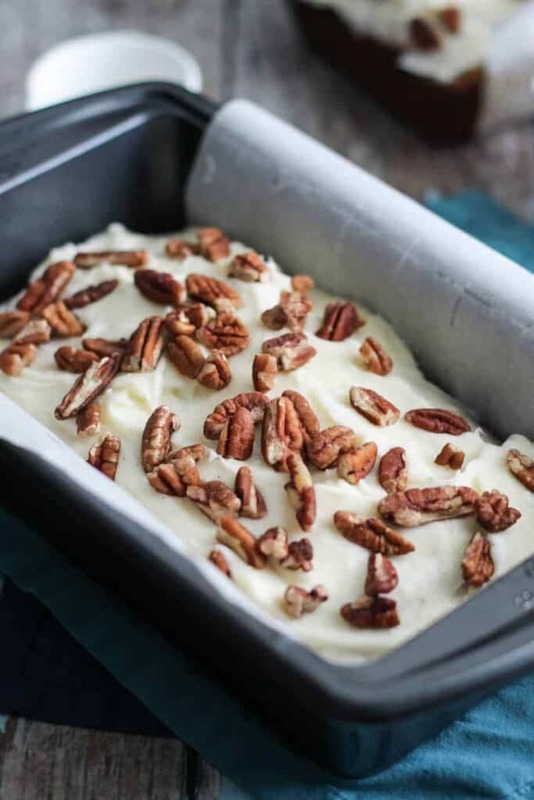 The pineapple and bananas keep it really moist, while the coconut and pecans keep things interesting in terms of texture. 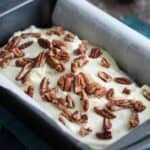 It’s all slathered with some sweet, but not too sweet, cream cheese frosting and sprinkled with more chopped pecans. This recipe comes from A Latte Food. Preheat oven to 350 degrees. Grease two 9x4-inch loaf pans with cooking spray or butter. Set them aside. 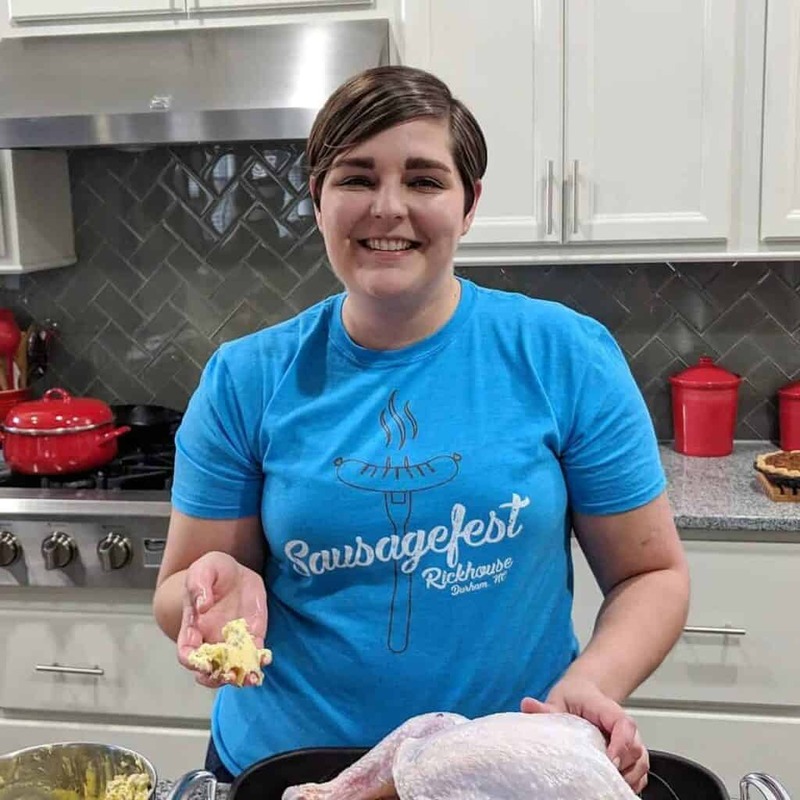 In a medium-sized bowl, whisk together the flour, baking soda, cinnamon, and kosher salt. Set aside. In a large bowl or stand mixer, cream butter, granulated sugar, and brown sugar together until light and fluffy. Add the vanilla extract. Next, add the egg, one at a time. Beat until combined. Add the pineapple, shredded coconut, and mashed bananas to the wet ingredients. Mix until combined. Add the dry ingredients to the wet. Stir until they are just combined. Add the pecans and stir until they are just distributed throughout. Bake the bread for 30-35 minutes, or until a toothpick, when inserted into the center, comes out clean. Allow the loaves to cool in their pans for 10-15 minutes before removing them from the pans to a wire rack to finish cooling completely. Beat the cream cheese and butter together until they are well combined. Add the vanilla extract and mix. Add the powdered sugar and mix until well combined. Spread the frosting over the cooled loaves. Sprinkle with chopped pecans. The listed preparation time does not include the time required to let the banana bread cool. Want more banana bread-y recipes? Take a look at my Chocolate Chip and Oatmeal Banana Bread, Healthy Chocolate Banana Bread, and Chocolate Chip Banana Bread Cookies! 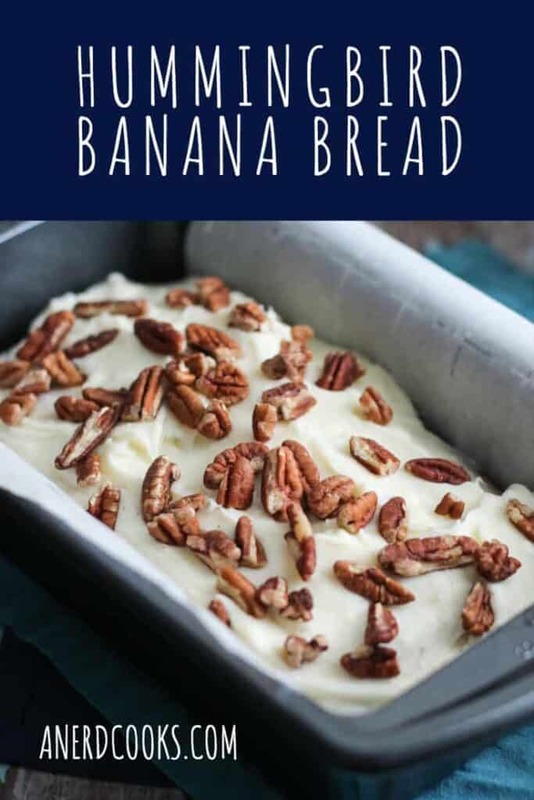 This is a great way to use up old bananas, love all the combinations of flavors in this banana bread, it sounds so delicious! Thank you! I’m always on the lookout for ways to use up old bananas. I have good intentions of just eating them outright whenever I buy them, but invariably some will always be left on the counter to over ripen. What a delicious combination of flavours! I’ve never actually tried hummingbird cake but that must change! I couldn’t agree more, Sasha! It’s so tasty and moist! After trying to make this receipe, adding the dry to the cream mixture was difficut because there wasnt enough wet to mix so it was a thick mess. I would suggest adding the pineapple and bananas to wet mixture and coconut and pecans added to dry before mixing all together. I also reduced flour to 2 cups and poured into one bread pan and baked at 375 degrees for one hour. It was a hit at the baby shower. Hi Janice! Sorry to hear that it was a bit of a thick mess… I can certainly make note of your suggestion! So glad to hear that folks enjoyed it, though!